In an epic nail-biter, the Ducks came out victorious with an impressive three-pointer from Joseph Young with only 1.1 seconds left to take the win, 67-64. With only one second left on the clock, the Utes were unable to answer back and the celebration started on the court. For the second time this year, Oregon took down No.17 Utah in stunning fashion. 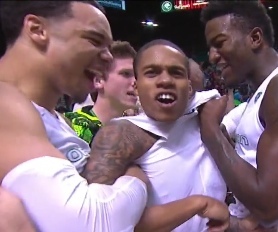 Young led the “Men of Oregon” with 25 points, four rebounds, and three assists. In addition, Dillon Brooks added 14 points and Elgin Cook finished with 13 points, while Jordan Bell had three big blocks. As they were against Colorado, the Ducks were down going into halftime (31-30) but rallied back by coming out with an explosive second half performance. With less than a minute left, Utah’s Dakarai Tucker nailed two free throws and drew an offensive foul from Young. 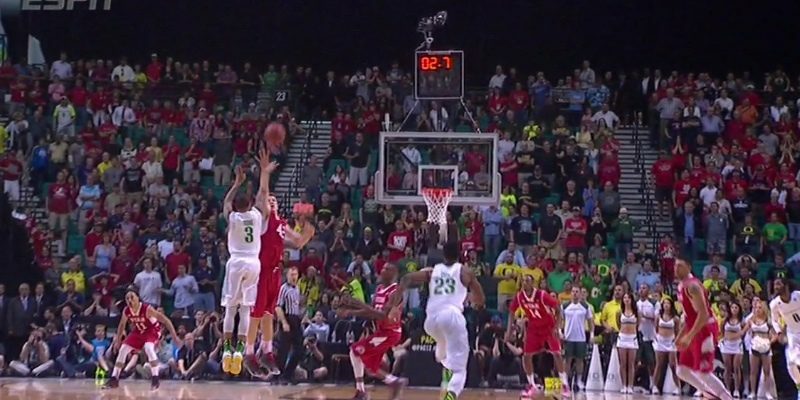 According to GoDucks.com, immediately after Tucker’s free throws, Coach Dana Altman called a timeout and Young voiced himself by saying, “I want to bring it up.” Eventually, this led to Young’s amazing pullback shot from well past the three-point arc that set the crowd and broadcasters on fire. Despite the fact that Young turned the ball over, he maintained his composure and “made a play at the end, won the ballgame.” Next up,Ducks will face No.5 Arizona for the Pac-12 Tournament title, whom they have lost twice to during the regular season. What caused the Ducks to fall far behind during the first two games was how Arizona out rebounded them and shut down Oregon’s offense. Altman mentioned in his post-game interview that the Ducks “will go into the game pretty loose and have fun with the game.” He continued by explaining how the Wildcats’ athleticism and size have given his team a great challenge in keeping up with Arizona. The Ducks will need to come out explosive on all cylinders and make sure that they compete throughout the whole 40 minutes. Friday was surely a victory that will be remembered in the books, but Saturday will be pivotal in the Ducks making a possible mark in school history.